Imagine looking into a department store window at the mannequins displaying the latest fashions. All of a sudden you see a reflection of yourself standing along side the fashionable faceless people in your baggy sweatpants and t-shirt. 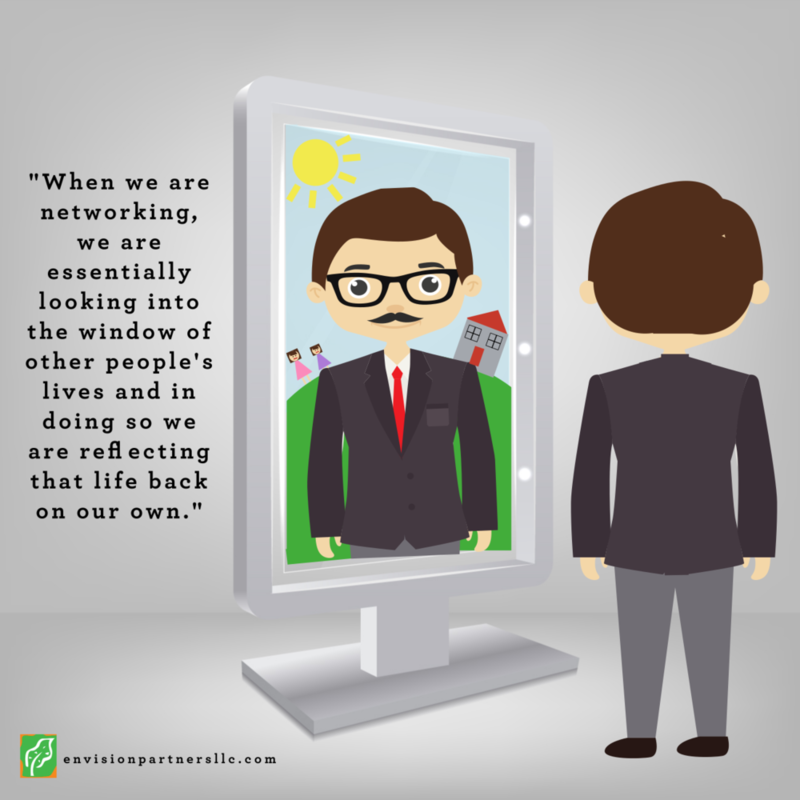 When we are networking, we are essentially looking into the window of other people’s lives and in doing so we are reflecting that life back on our own. The value of a network becomes vital when we are looking for a new job. Too often that’s when we decide we have enough time to schedule meetings with former colleagues, people from LinkedIn or the father from our kid’s softball team. However, networking has great value even when you are not “looking for a new opportunity”. When we get together with other people without the pressure of a personal agenda, there can be a lot less stress and preparation. Even for the faint of heart, networking can be enjoyable. It’s pretty easy if you set up the expectations for your networking partner that you want to “catch up” or “learn about their experiences”. Therefore, this type of networking is not intended to be one to which you ask your CEO or someone who might be a mentor, for example. Everyone has a unique story or perspective or some information that would be exciting or useful for you to learn about. This information or their background does not need to be inherently and immediately relevant to your current work or life situation. These alternative perspectives and experiences are enriching in their own right and, like doing art, reading or having a hobby outside of work, can inspire additional creativity in your work time. Invariably, while we are listening to another person’s stories or recalling them afterward, we are reflecting their experiences onto our own; their choices against ours; their skills and abilities compared to our own. This reflection challenges us. We will ask ourselves questions like: Would I do that? Would I be able to do that? What would happen if I was in such a situation? I wonder if that would be a good idea for me to try that too? I am sure you can come up with a lot of questions. Most people really enjoy talking about themselves, even if you don’t. Asking for someone else’s story does not necessarily mean that you have to give your story too, but it will be valuable for the other person to hear what you learned from them or what interests you about their story. Putting the reflective expectation on yourself makes the networking time most impactful for your own growth and development. In this way, you get the most out of the experience- a bit of a summary right there on the spot. And while your networking partner is listening to you capture what you heard from them, they are looking into your window. They are learning about you, and in-turn reflecting on what they just shared with you. Learning what was interesting and exciting to you and is an opportunity to learn something about themselves. By hearing, or reading, other people’s stories we become inspired; we become challenged; we respond by changing our mind about a subject or we become stronger in our convictions. All of this is learning more about ourselves, and why looking into the window of someone else’s life also gives us the opportunity to reflect on our own lives. Why Did You Come to Work Today?